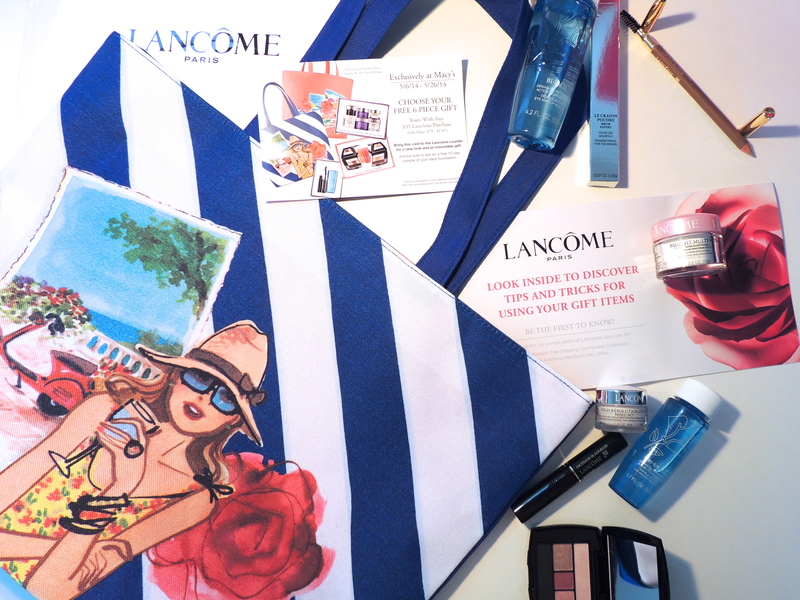 LANCOME Spring 14 Gift With Purchase - Give Me Gorgeous! 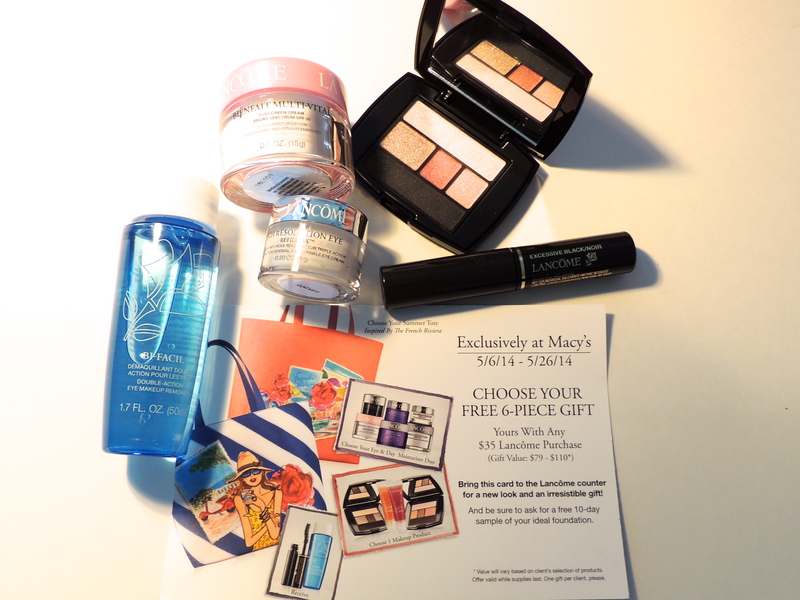 Macy’s gift with purchase for Spring/Summer began today. I had pre-ordered their Bi-Facil Makeup Remover and a Le Crayon Poudre Brow Pencil to receive this offer. The 6-piece gift set came with the choice of an eye and day moisturizer duo, one makeup product as well as a small Bi-Facil and mini Hypnose Drama mascara (so handy for my purse makeup bag). 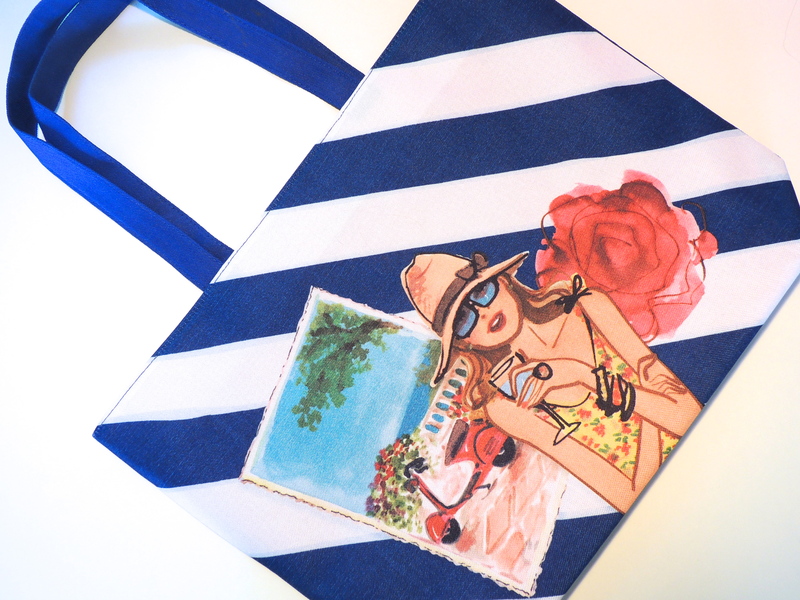 Plus, there was the option of either a coral or blue and white French Riviera tote. This was the perfect opportunity to re-stock my makeup remover, and Lancome’s Bi-Facial I have found to be one of the best! You need to shake it each time before using it to activate its two main ingredients of lipids (to erase eye makeup) and emollient water (to refresh skin). 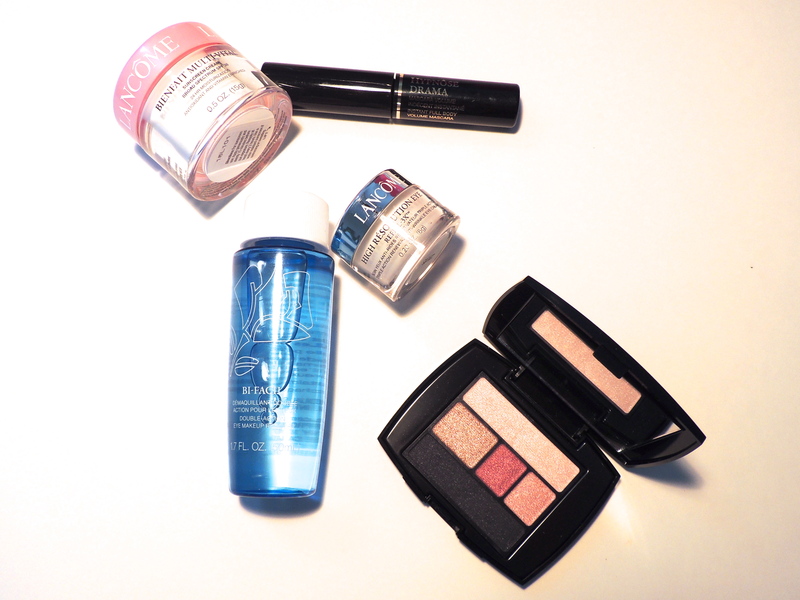 The remover is especially good at taking off waterproof mascara or hard to budge mascara. I usually use it with a cotton makeup pad to first remove eye makeup before washing my face – I have found this it works best to do this before washing my whole face because it allows the soap to wash away any residual makeup remover and ensure throughly clean skin. It also works great with a q-tip to get rid of any running mascara during the day. It has a slight fresh scent, and is safe for both sensitive skin and contact lens wearers. Le Crayon Poudre brow pencil was the other item I purchased, and I decided to get this because I needed a brow pencil that was slightly lighter than the one I have been using – one that would work well with blond hair and summer days. The Natural Blond shade is a pale warm brown color, that looks very natural and is totally blend-able. The spiral comb on the other end of the pencil, is great for first grooming the brows to be able to note and fill in any gaps between hairs. Both tote bags were lovely, with postcard sketches of Riviera sites. 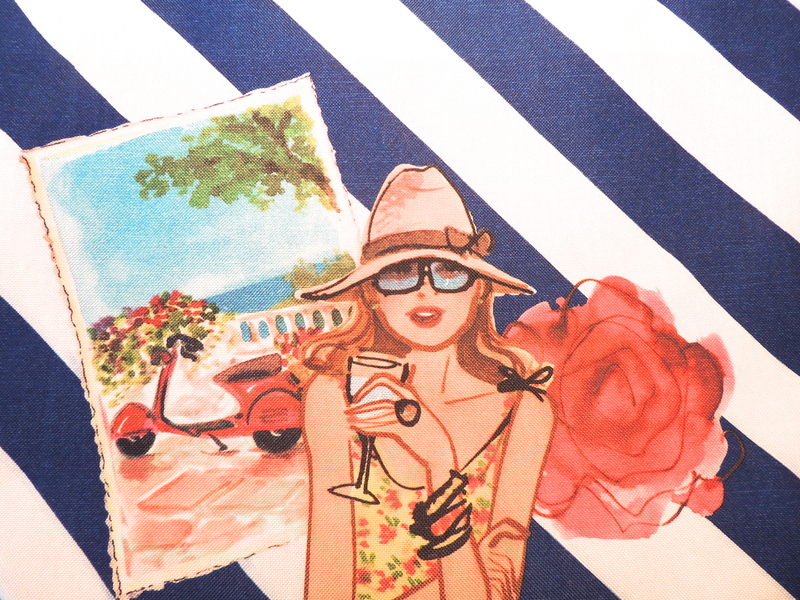 I chose the blue and white bag because I liked the drawing of the lady in summer clothes on the front (reminds me of a sunny vacation). For the moisturizer duo, I chose the Beinfait Multi-Vital Sunscreen Cream because of its 24-hour moisture and broad spectrum SPF 30 and the High Resolution Eye Refill 3X for its anti-wrinkle properties. Love getting the tiny mascara for travel or carry and the small Bi-Facial will also be convenient to take along on vacation. Finally, for the makeup item choices were one of two different small shadow palettes or a lip gloss. I chose the eye palette that replicates the colors of the Color Design Blush Sweetness palette #209. It comes with 5 frost shadows in the colors of black (good for lining eyes), ecru (for lids), a beige (crease), medium pink and pale pink.